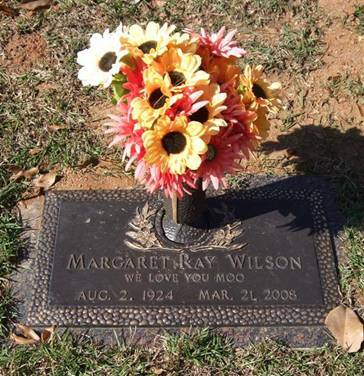 Margaret Ray Wilson, age 83, of Little Rock passed away March 21, 2008 surrounded by her loving children at Grace Health Care in Benton. She was born August 2, 1924 in Glenwood, Arkansas the daughter of the late John and Grace (Alford) Ray. She was a member of the St. James United Methodist Church in Little Rock. 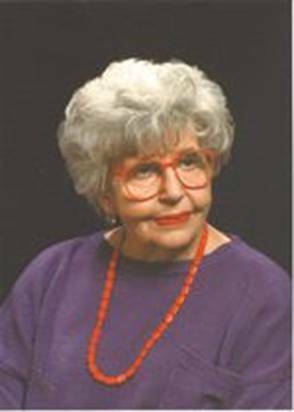 She was married to the late Warren R. Wilson and was also preceded in death by a daughter Sylvia Gay Wilson. Margaret “Moo” was a loving mother and grandmother and had a heart of gold. Margaret is survived by her son Mark Ray Wilson and wife, Sheila of Malvern, daughter, Jan Frith and son-in-law, Warner of Little Rock, four grandchildren, Robert, Drew, and Ashleigh Frith, and James A. Crace. Graveside services will be 11AM Tuesday, March 25, 2008 at the Pinecrest Memorial Park near Benton with Brother Gary Jennings officiating. Honorary pallbearers are the Nurses and Staff of Grace Health Care and Saline Memorial Hospice. Arrangements are by Regency Funeral Home. You may sign the guestbook at regencyfuneralhome.com. AAFA NOTES: SSDI records confirm the birth and death dates of Margaret R. Wilson (SS# issued in AR), last residence Little Rock, Pulaski Co., AR. For more information on her family, see AAFA’s published genealogy, Descendants of Robert & Susanna Alford. Her Alford lineage, from her mother: Grace Lovena 1897 AR2, William Madison 1855 AR3, David Winston 1823 AL4, David 1785 VA5, Rovert 1760 England6.